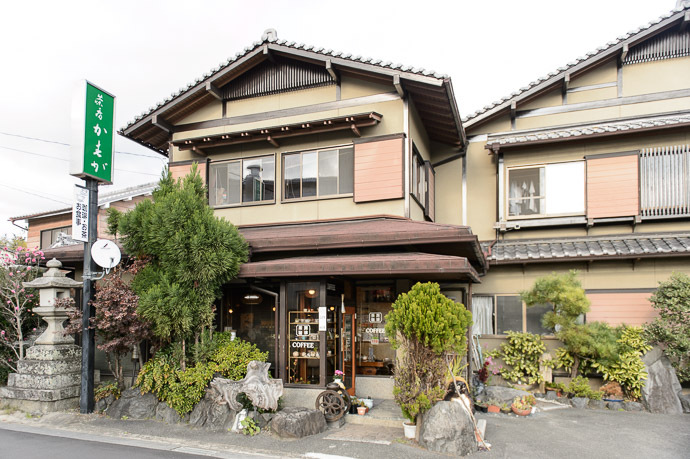 After yesterday's visit to the spectacular Yoshiminedera Temple in south-western Kyoto, we stopped for lunch at a restaurant we happened across on the way to the next temple. 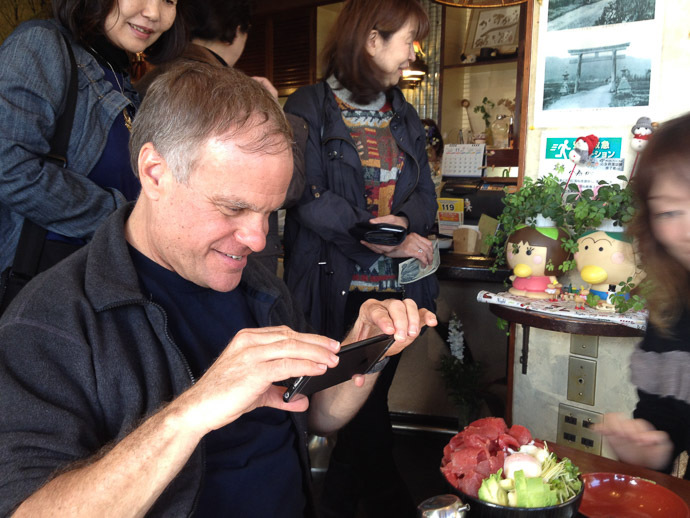 It seemed like an average lunch cafe, but it had a shocking surprise in store for us. 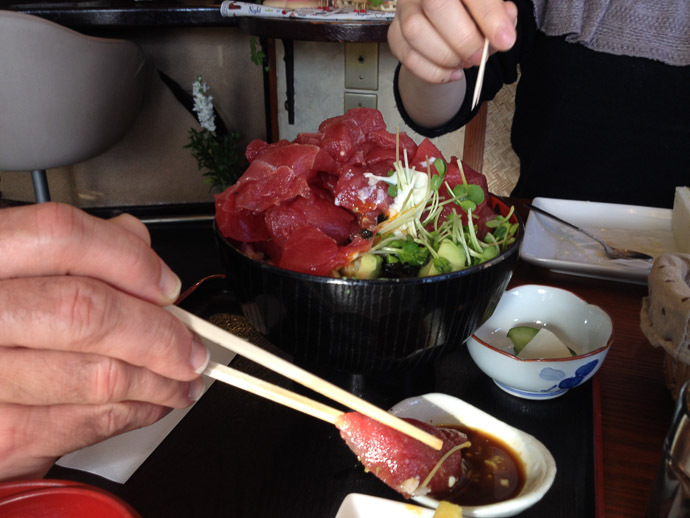 Paul ordered the “tuna sashimi (raw tuna slices) and avocado over rice” lunch. 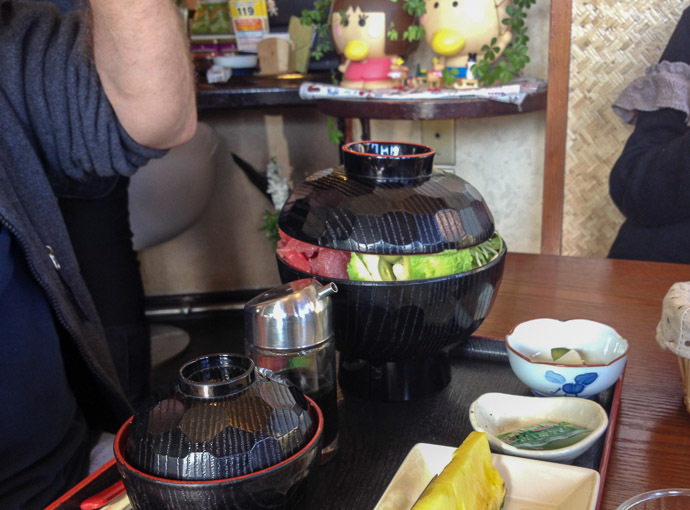 At just 1,200 yen (about US$10.50) one doesn't expect much fish, so he ordered the large. What he got was a shockingly large amount of fish... 8 to 10 times the amount expected. At first this brought to mind the excesses of the not-so-far-away Hagi Burger, but those comparisons soon melted away as we realized that the pile of tuna sashimi was not propped up by an interior of rice... it was really just that big. We're not big on taking photos of everything we intend to shove in our mouth, but this was just beyond ridiculous. The experience required documentation. The Japanese word for a regular order is the regular word for “regular”, futsuu (普通). The word for a large portion of food is “oomori” (大盛り). These are standard words you'll find on most any menu, but Damien taught us two slang words that sort of help to describe the situation. The next step beyond “large” is “mountain large” yamamori (山盛り), which is pretty easy to figure out as it calls to mind the image of food being piled up like a mountain. I suppose this is similar to “super-size” in American English. In America, some folks might add a next step beyond “super-size” along the lines of “Texas size”, but if you really want to go to the extreme... beyond plausibility right to the edge of possibility... you'll want the Japanese word for the step beyond “mountain large” — such a ridiculously large amount that you could only see it as a wildly exaggerated caricature in a Japanese comic book — is called “comic large”, which sounds so much better in actual Japanese: mangamori (マンガ盛り). The name of the restaurant is “Kasuga”, so I think we have the birth of a new slang word beyond manga mori: “kasuga mori”!